Just inside the gates of Parkview Cemetery, the Adams County Veteran's Monument dedicated to each of the branches of the United States Military stands proud. 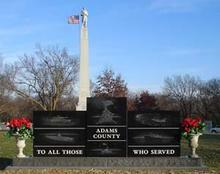 The ten individual monuments that make up the Adams County Veteran's Monument include names of those, both living and deceased, who have served their County. Monument Circle is also the location of the Adams County Civil War Veterans Monument.